S.K.SAINI: A story of love, of negligence and bravery. A story of love, of negligence and bravery. This is a long post and one that will hopefully deter anyone from ever taking their pets over to a specific Vet clinic. I won't be naming names. It's a local Vet and it's been absolutely gut-wrenching and upsetting because of what they did and didn't do. 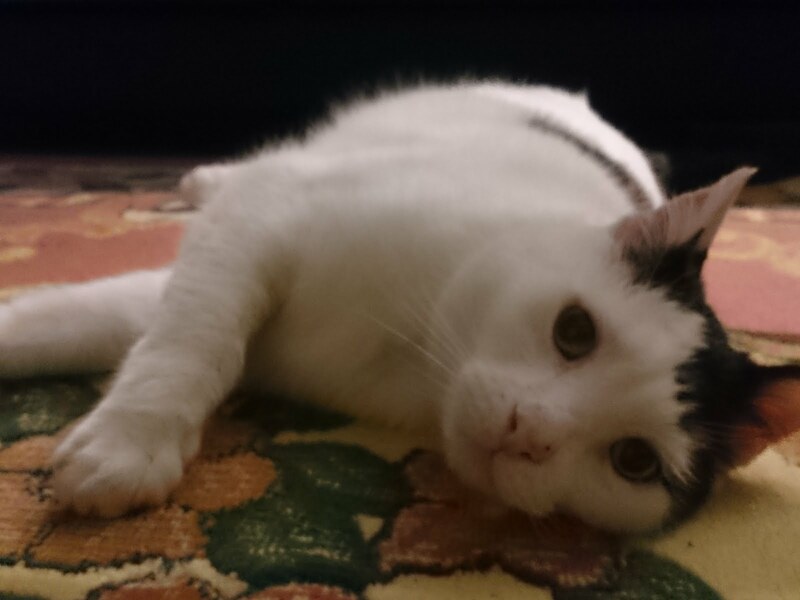 I guess this is kind of a lessen learnt sort of story, but it's also a story of how brave our wonderful family cat is, who has had to suffer over a period of nearly three months because of their negligence. My family and I haven't stopped crying and are heartbroken over what's been happening. It's been extremely stressful for all of us. Anyone who says anything less is completely selfish and ignorant. Our cat Shiva is 15 years old. We've had him since he was a small kitten. He was healthy, albeit a couple of tumours on his ears and nose, so we took him to the animal hospital (since 2010) on the 27th of January, 2017 to finally have the tumours removed (tips of his ears chopped off). The tumours only started showing up a couple of years ago at least, so luckily it's only the beginnings of it. It's very normal for white cats to get them. On the day of his surgery (27th of Jan, 2017), we took him to the hospital and we encountered a woman nurse (let's call her Jane for anonymity) who came to do the pre-medical check up on our cat. She was absolutely rude when he wouldn't stay still for the rectal thermometer. *Jane* said rather rudely, "If he doesn't stay still, he'll die during the surgery. You don't want that do you?" I was shocked. I had to hold my tongue as she was treating him. My sister had encountered the same woman beforehand and made a complaint against her to the Vet who took care of him and he said it wasn't the first complaint about her. She was going to be spoken to about ber behaviour. Speaking to so many people now since all this has happened, they've encountered the same woman before, made complaints and nothing has been done. Why is someone like her even working at there? On the same day after the surgery, we went to pick him up. When they brought him out there was blood everywhere on his ears and fur. The nurse gave us a bloodied Elizabethan collar (cleaned it roughly, blood smeared on the inside). She told us he was very aggressive and caused so much trouble for them when they tried to put the collar on him. What did they honestly expect?! My poor baby had the tip of his ears chopped off! The area was still very fresh from the surgery, still extremely painful and even more he was in even more blinding pain when they tried to put the collar on him with his ears pressed against the collar. He was screeching in pain. I've never heard him in such pain in my life and it made me cry. I couldn't believe they'd actually do that and then ask us to try it when we got home. I ended up paying for a little sedative to give him because he kept scratching at his ears and blood was dripping everywhere in the house (I won't forget him jumping on me to lie down, he shook his head and blood went everywhere). He slept for the whole night. On the 30th of January, 2017, blood test results indicated that his kidneys and other organs were perfectly fine. A few days later he stopped eating and drinking water and we had to forcibly give him water via a syringe to keep him hydrated. 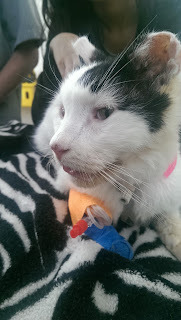 When we took him to the vets, they suggested to continue using the syringe and wet foods. He started drinking from the syringe and we ended up hand feeding him to get him to eat. The next couple of days he was walking very unbalanced and kept falling over. We took him back to the vets again and they said he had an inner ear infection and gave him a course of slow-releasing antibiotics for about two weeks. It was so bad he was barely eating and drinking water. He was given appetite stimulants to get him eating again. We started getting extremely concerned when his unbalanced gait was worse and then he started drooling. Phlegm-like mucous would drip and sway from his mouth. We took him to the vets and they said it was his ear infection causing it. Then every time he ate or drank water he was throwing it back up. Extremely concerned, we sent him back again to the vets and they told us to wait until the antibiotics were up and that the ear infection would subside after 4 more weeks. We couldn't stand our cat suffering the way he was and he was getting more lethargic, had an uneven gait, sleeping a lot and throwing up. On the 28th of Feb, I made a post on Facebook regarding his situation for a second opinion. Many people before this recommended Lort Smith and I have never heard anything bad about them for quite a while now. Then suddenly a couple of days later he started drinking heaps of water. You'd think that's good right? No. He'd drink so much while drooling out the phlegm (this was constant and we would wipe his mouth and clean out his water bowl every few minutes because it was so bad) and he'd throw up phlegm. He'd eat his food, he'd throw up. He'd keep drinking his water for 5 minutes at a time and throw up. We knew for sure this wasn't the ear infection, so we sorted a second opinion at another animal hospital. Lort Smith Animal Hospital. 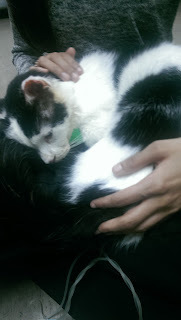 We took him in on the 10th of March and on the 11th, they called to tell us our cat's kidneys were failing and he was diagnosed with Feline AIDS, bronchitis, severe gingivitis and end stage kidney failure. Outside cats are more susceptible to Feline AIDS and he hadn't been an outside cat for more than a few years. 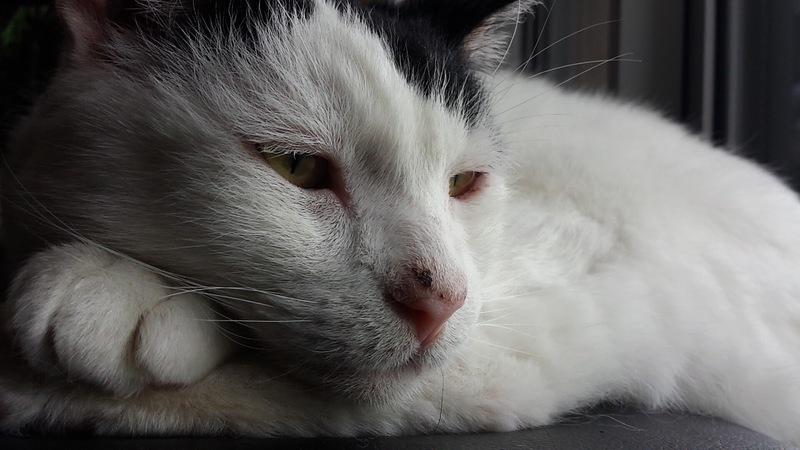 He was vaccinated against FIV many years ago and blood tests never showed he had the virus. Unfortunately we never realised, the local Vets never picked it up and we weren't told by the Vets that the FIV vaccine was a yearly vaccination. THIS SHOULD BE COMPULSORY. We went to the hospital on the 12th of March and they told us his condition was very serious, a "grave prognosis". He wasn't eating or drinking, he was very dehydrated and they hooked him up to get fluids to rehydrate him again. They told us it was the late stages of kidney failure. Absolutely heartbroken, and seeing our poor baby so frightened and skinny, we told them to keep giving him fluids. The day before they suggested to put him down and we said no. They gave him an appetite stimulant and he was finally eating a bit and gained a little bit of weight. They said the fluids are working and he has severe gingivitis. They said his kidneys are slowly getting better because of the fluids and they need to make sure his kidneys are strong enough to survive the dental operation. He was also diagnosed with bronchitis, something the previous vet never picked up on when they heard his laboured breathing. After that, we were told that that his gingivitis wasn't that bad, his heart and lungs were clear (she had suspected that he didn't have bronchitis) and that during the ultrasound of his kidneys, it came out white. When it came out white, they told us it was a "white solid thick mass" covering both his kidneys. They did a biopsy the very same day and told us it could possibly be lymphoma. When we went to visit him (Dad, brother and I), they took us into the kitty ward as he was still groggy from the sedation and still hooked up to the IV fluids. The nurse opened the door of his cage and his eyes opened. Suddenly he heard our voices and his head lifted up, saw us and sat up meowing. He tried to walk out of his cage, but being hooked up with the IV made it difficult, and the sedation was still making him woozy. My Dad lifted him out of the cage and held him. Such a beautiful sight. Then I sat him in my laps and he turned into a position he was comfortable in and slept in my laps. He was so happy to see us. Our thinking is...if we see him everyday while he's there, he wouldn't get lonely, and the healing process would happen faster knowing that he wasn't neglected or alone. After that, the biopsy came back clean. No lymphoma. Yay! It was such a relief. They eventually sent him back home telling us that he actually has early stages of kidney disease (not end stage as we were previously told) and the IV helped a lot. They wanted to discharge him. So I went to go pick him up from Lort Smith, waited for nearly two hours (because my train got delayed and I missed the appointment) and the nurse came to speak to me about discharging him. When she brought the cat carrier out, I could hear him meowing (it was a cardboard box carrier from Lort Smith because we didn't know he was coming home until later that morning and we didn't have his cage). She opened the box and his little head popped out, still meowing he saw my face and his eyes changed. He let out a little meow and I was caressing his cheeks (he leaned into my hands really hard) while he was purring loudly. The nurse was so happy at his reaction. When we brought him home (he lives in two houses. My sister's and ours with only two minutes apart), he wasn't eating properly. His tongue was still sticking out, he was very skinny (actually anorexic), and his balance was as worse as ever. The next night, I spoon-fed him some homemade chicken soup I made for him (putting some on a spoon and he'd slurp it in because he couldn't open his jaw properly). He ate a little bit, not enough, but it was something. When I filled up his water, I filled it only halfway (a full bowl is too much water and because of his uneven gait and uncoordinated senses, I didn't want him to end up drowning) and sure enough later that night, HALF his face was inside the water as he drank water. I knew it. NEVER put a full bowl of water. If you know your cat has issues with his/her balance, and they're obviously not blind, don't put a full bowl of water. Especially if you aren't observing your cat 24/7, at least you'll know they won't drown because someone filled it up to the top when they didn't listen or see the signs of his/her appearance. The next day, Dad and I took him back to Lort Smith. The family had suggested that we put in a feeding tube because he wasn't eating properly (and obviously hungry the poor bub) to help him gain weight again, which would help bring back his energy and strength. As soon I was waiting for the nurse (my Dad had left for his appointment next door), a nurse came out and she talked to me about why we were classing our cat's case as an emergency. I told her he hadn't eaten since he was discharged two days prior and that we required a feeding tube to get food in him pronto. She told me that they had a lot of other patients who would be high priority and that the wait time would be over an hour. Since I didn't want him stuck inside the cage that long, I asked her if we could use a room so he can use the little box (as he had drank a lot of water before coming) and drink some water as he would be thirsty. Unfortunately no room was available, but she took him for a while to give him water and make sure he was comfortable. Not even 5 minutes later, she comes back out again and tells me a Vet is currently looking at him and he'll call me in within the next few minutes. Within the next few minutes, the nurse comes back out and calls me into Room 1. Our cat was all alone in the room, on the floor and sniffing the door in front of me. A bowl of water was on the ground and a little box was beside his cage unsoiled. As soon as I closed the door and he saw me, he automatically came to me meowing. I put him on the table as soon as the Vet in and he introduced himself. He told me that our cat was bitten by a snake. I was flabbergasted. What? "That's impossible," I told him. "He's an indoor cat. I'd know if there was snake in the house." He seemed confused. "Oh. You see here?" He showed me our cat's face. "I feel he has partial facial paralysis. That's most commonly consistent with a snake bite." I told him he was an indoor cat and then he went on to say that brain tumours could also be one too and that quality of life would be horrible for him (especially since he's a senior cat) and that an option would be to put him down. I automatically said no. "We don't know for sure whether or not it's a brain tumour. We're going to do whatever we can to confirm this tumour first." He told me that our cat didn't have a gag reflex which is why he wasn't eating (he put his finger down his throat and he didn't flinch or gag once). He told me that his tongue was sticking out and he wasn't blinking either (he pressed a reflex area near his eyes and he wasn't blinking. I told him that he was sleeping just before he came here and his eyes were closed. Unfortunately Shiva wasn't blinking in front of him and my guess is because he's in a new area and he was very alert with this stranger in front of him. I had my arm around Shiva and for the first time he was actually very calm and purring on the table. I held him with one arm under his head and the other patting his head. I couldn't believe how calm he was. Such a good boy. The Vet mentioned about CT scans to confirm if there was a tumour and I called my sister so she could speak to the Vet too. After he hung up, I told him that since he felt it was a brain issue, maybe an infection could cause it too. He agreed with me. Then I told him about the bad ear infection he got after his ear surgery. I told him he started developing the balance issues when the ear infection happened and that maybe his ears are the ones causing this whole trouble. Then asked me whether or not he's had fluid in there before and I mentioned that a couple of weeks back, my sister took him to get all this fluid out of his ear. He agreed with me that it could be the ears, but he was also quite adamant that it might be a brain tumour as well. 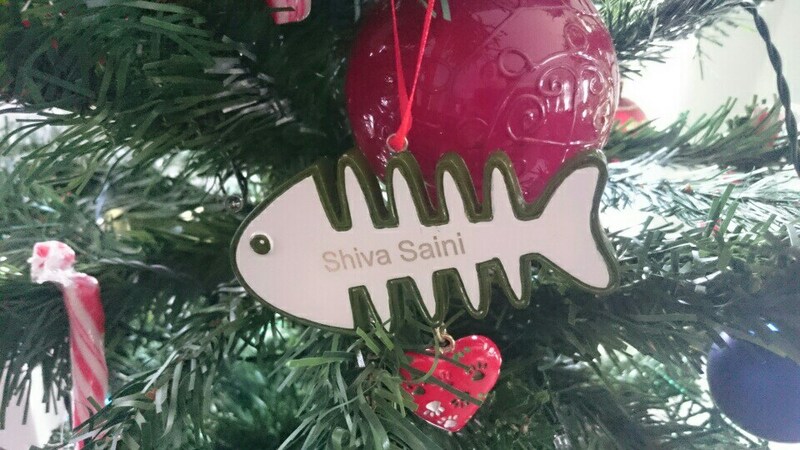 He left for a while to get the paperwork sorted and I put Shiva on the ground. He walked around for a bit and I sat on the chair and he came to me. He put a paw on my leg signalling he wanted to sit on me, so I carried him and laid him on my laps. Feeling secure and safe, he started purring and fell asleep. His eyes were closed (this signified for me that it wasn't a brain tumour for that reason). The Vet came back with the paperwork and checked his ears and eyes. He wasn't going blind luckily, and he told me after what I said, they'll thoroughly check his ears while doing the CT scan. They were going to put the feeding tube in that day. 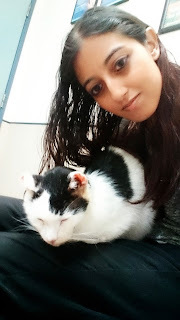 He told me that Shiva was otherwise healthy and stable (his kidneys are stable) and that it was just this small issue that needed to be fixed. I signed the paperwork and gave him Shiva. He looked so comfortable in his arms. "He'll be getting lots of cuddles and pets, don't you worry about that." Such a cutie. The next day, the CT scan came back normal. No tumours! We knew it. But they did check his ears and found there was a LOT of fluid build up and they drained it out. Then they found abnormalities in the fluid and sent it off to pathology. At the moment, we don't have the results yet. I'll update it when we do though. Now after many tests, which included a biopsy on his kidneys (as they showed white in the ultrasound) he's been okay. Everything they said he had, he didn't have. This was such a relief. With the support of family and the local Community group on Facebook (despite a couple of people who wanted attention for their own selfish reasons about this), this whole situation has been incredibly stressful for my family and I, especially Shiva. He has a feeding tube in now and hopefully this will enable him to finally get the nutrients he needs. The tests that got it right however, are the beginning stages of kidney disease, Feline AIDS (which was never picked up by the local Vets), some dehydration, no lymphoma, no brain tumour and no Bronchitis. 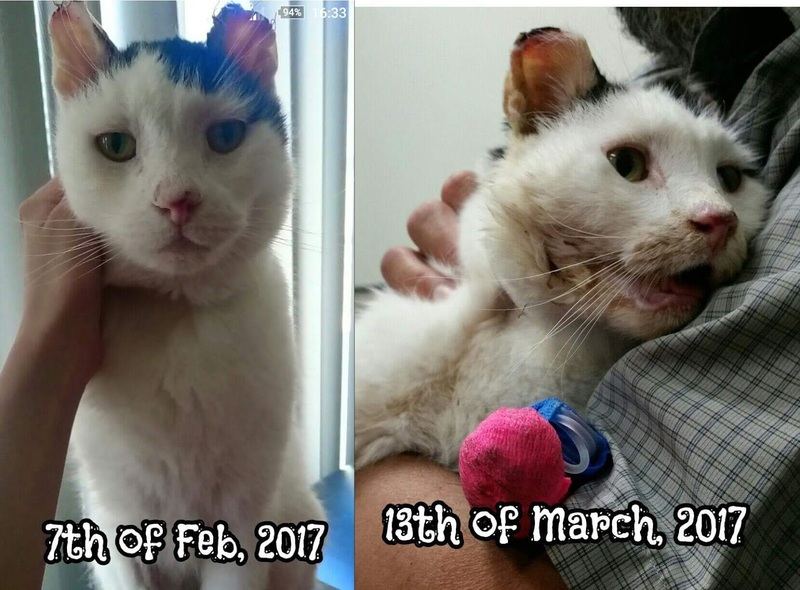 He has been through so much and he is on the road to recovery with the most loving family ever. We have all banded together to do everything and anything for him. He has us all wrapped around his little tail (well...long tail). Lort Smith is helping out our cat so much. They found more wrong with his condition than the previous place. The other Vets never listened to our concerns and they didn't dig deeper when he was getting worse. They never told us that he had Feline AIDS and it was apparently so bad that it's weakened his kidneys and caused him gingivitis (but his gingivitis isn't as bad as they said it was luckily). The fact they never picked this up and helped him makes me so mad. My poor baby is suffering because of the way they dealt with everything! They put him into this situation, into this suffering. I am so thankful for Lort Smith, but extremely angry at the previous place. 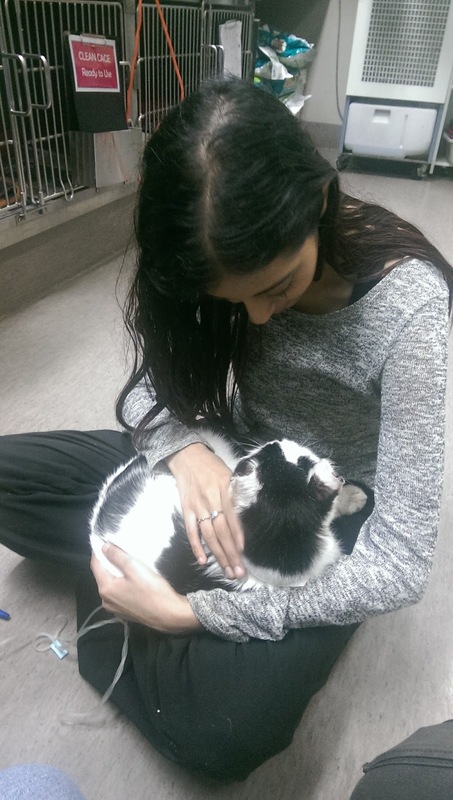 Our family cat is suffering because of them and I don't want anyone else's loved ones to end up the same. The staff at the Lort Smith have been so amazing. They're informative, they have a staff member who is learning human nursing sit with him all the time (only on the one day as she was there), and she even cooked him up some chicken and bought him tuna to try and eat. That is love and care! Not putting an Elizabethan Collar on him while his ears are still bleeding. They would never do that. I hope this post makes people question their Vets and asks them questions. DON'T believe everything they say! If your gut instinct tells you to get a second opinion, GO FOR IT. If people don't listen to you to get a second opinion, force it on them! Don't wait until the last minute when something even worse happens and it's too late. Don't let one place treat your furry loved ones. UPDATE: Unfortunately Shiva passed away on the 1st of April, 2017 in his sleep. We still have no idea what was wrong with him. We ended up taking him out of Lort Smith (as they basically gave up on him) and took him to the Werribee Animal Hospital by Melbourne University. He was meant to go for an MRI and spinal tap pathology test, but unfortunately they told us he was too weak to go for it and they were afraid he'd die on the table. We brought him home the next day and he last for just over a week before he passed away in his sleep. I took him outside three days before he passed away for the first time in a long time (and his final time) which he absolutely loved. I miss him so much as does my family. We can't imagine our household without him, but I truly hope he's at peace. I never got to see him the day before he passed (my sister had come home early and took him back, even though I left Uni early to spend time with him)....but he came into my dreams the morning of his passing. I didn't know at the time he had died, and he circled me and rubbed against me, thanking me, telling me how much he loves me and just how happy he was to have been a part of our lives. I know he's at peace now, but his loss is still very hard. That last photo was taken on the 18th of March, 2017. Looking so much better! Always question your vets, never take their word as gospel truth. Unfortunately our local vets never said cats needed an annual FIV vaccine. They do! Don't forget that. While cats can live happy lives with the AIDS (but still need careful observation as their immune system will be degraded), make sure you follow your instincts when you know something is wrong. Make sure you question them and make sure you don't let selfish individuals make you feel wrong.